Hello from Texas Everyone. I have never seen anything about Judy Niemeyer quilts on this forum. I recently took 2 classes and am in love with it. I made a mistake and jumped right in to the Wedding Ring Star. Last week the certified instructor, Denise, offered a beginners class which I took and it all come together. I was just wondering how many of you are into this and if you are having problems how do you solve them. I think I have made every mistake that can be made but I don't stress about it, Denise says one day things will just click. I wish it would hurry, I love doing this. It's so accurate just sewing on the lines. A big thank you to Denise and all the Ladies at Pin Wheels & Posies, that my happy place and favorite place to just hang out and get inspiration. I take as many classes as my budget and time allows. Thanks to all you nice ladies for the good information, pictures and tutorials. ​I am pretty sure that there have been some of her patterns done and posted on QB. for one thing, check her site online for error corrections. they are there. I just bought a circle quilt pattern (turned out to be a tree skirt actually) and there were several pages of corrections. most frustrating! Oh yeah, there have been many, many posts and pictures of Judy N quilts on this board!! I say kudos to the gals who make them!! Both Pittsburgh Pam and myself are currently making Judy's pattern Agave Garden. Pam has posted pictures in progress. I have not. Pam changed the color way, I am making it close as I can to the original. It sounds like you may be new to paper piecing. Of course, Judy's patterns are PP on steroids! LOL. Agave Garden is my first Judy Niemeyer pattern but I also bought the feathered star wallhanging. I may or may not add to it to make it bedsize. 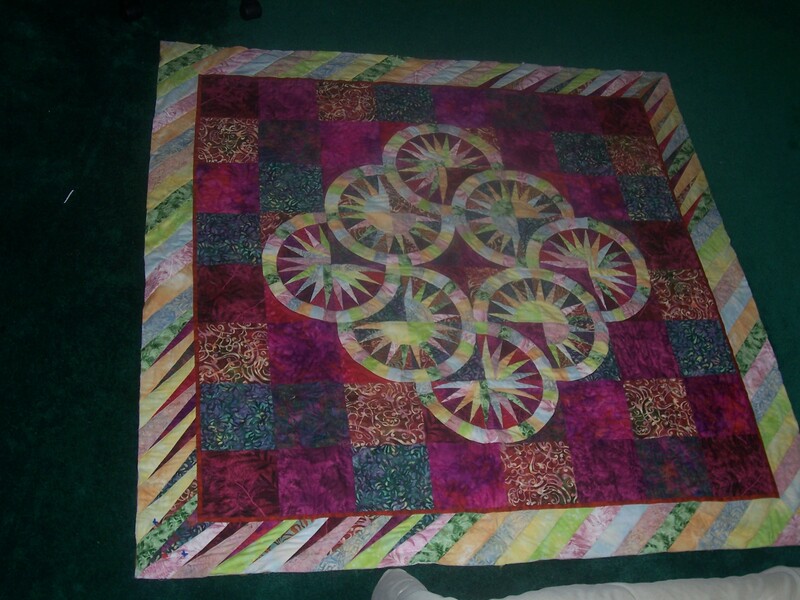 I also took a class on making her quilts back in 2009. Loved it was my first time to do paper piecing. Here is picture it was not quilted at the time just a completed top. I believe I gave it to my sister do not have a picture of it quilted though It was her pattern " Quilt of Thorns". I sold a couple of her patterns I had as someone was looking for some. Love the border on Quilt of Thorns, Christine! I am currently working on Briar Patch. It's actually going along quite well. Another Judy Niemeyer certified instructor is speaking/teaching for our guild in September...not sure if I'm going to go or not yet. I hear she's excellent. Judy Niemeyer is one of my favorite designers, I have made several of her quilts. Here are a few of mine. I have her Bird of Paradise - all the pieces are cut and one block is complete. Then it got buried under a big stack of projects. Need to dig it out and get it done!! I'll post a pic as soon as I get the main blocks done. Color selection has been a challenge...I'm sort of making it like the pattern shows, but having to pick fabric as I go for parts of it. 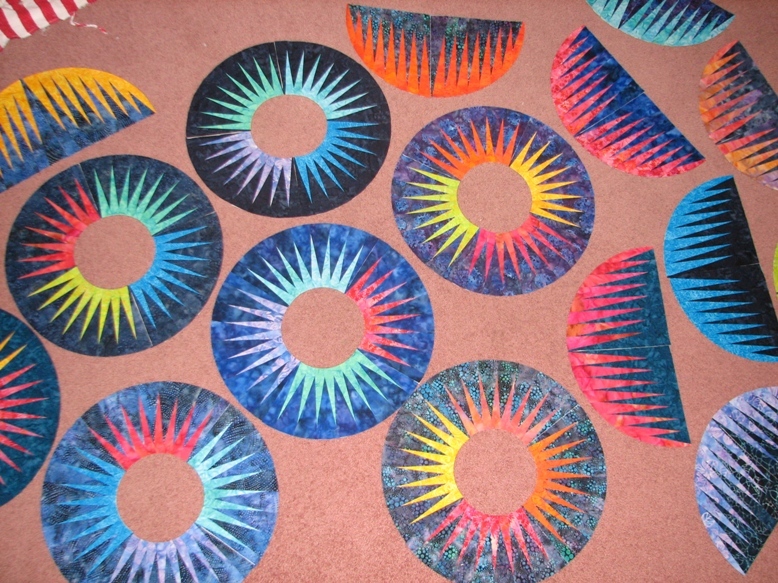 Using up a stash of hand-dyed and batik fabrics. Just go to "advanced search" and type in "Judy Niemeyer" and click "posts" and you will find lots of posts/pictures from others working on Judy Niemeyer projects (not me, they look above my skill level! beautiful quilts, though). I will let you know. I signed up for the Amazon Star BOM, starts in August. When I get it done, I will post. beautiful quilts.. some day I will tackle that. I have a New York Beauty that is a Sharon Stone pattern... Loved the way it turned out.. I absolutely love JN Quilts. I have the Tropical Rainbow started but not finished yet. I found the method Judy used for cutting instructions daunting. Our certified instructor had to spend a lot of time with us explaining it, as it was very confusing. JN instructions had us cut strips, place them in ziploc bags, then get strips out, cut some of them various ways, place in other ziploc bags, and on and on. I would have preferred just simple cutting instructions. It's really beautiful. I won't tackle one unless it's offered as a class. I just to new at it but I really love doing it and some day hopefully will do one by myself. I want to do the log cabin and Denise said it is really easy. She will be teaching the class and I will take it. Thanks everyone for the comments and pictures. You all do amazing work. Love your Quilt of Thorns! Very pretty! I also love Judy N quilts. Time consuming, but beautiful. Love, love, love the quilts. They are so beautiful and colorful! But I believe they are more than a couple steps above my ability level --- for the moment! I started the Bali Wedding Star with Judy as teacher and it's sitting in the pile. I still want to finish it, but get sidetracked. I am going to do one from her Lone Star series in November when she comes to my LQS. Yes JN quilts are not for the faint of heart. My JN "Feathered Goose" is at the LA quilters, orherwise I'd proudly display it. It was a lot of work!! I have been drooling over Judy's quilts for a couple of years. I love to paper piece. My next project might be her Mariners Compass quilt. I have the pattern and have been studying it for weeks. There aren't any certified shops in this area. I think the closest is 200 miles. The LQS that I don't like was talking about getting certified not sure if she ever did. I guess I will have to do it on my own. I bought fabric for the background yesterday. Not sure about the rest of it. Can't wait to start.